Google says it's Earth Day, so it must be true. I saw a Tweet from Beth Rhodes asking what we (or me, for this blog post) did to protect the Earth. It brought back some memories. I "participated" in the first Earth Day. Yes, I'm old enough to have done that. In fact, I'd been around for a few years prior to that (April 22, 1970). Our school had a big to-do about it, and us kids, we didn't have a clue what was going on. I still don't have a clue about much of anything to this day—at least that's what most folks will tell you. It's something I'm good at. Allow me to pause for a brief wheeze. I grew up spending every moment in the woods, or by the water, or both. I get good feeling when I'm in a natural environment, and that's becoming increasingly difficult to find in the Mid-Atlantic area. Of course, many kids spent time outdoors in the woods or fields when I was young. I don't see that interest in the younger folks these days, but I don't want to generalize too much. I haven't done any research into this that would stand up to scientific scrutiny. But when I go on hikes with local groups, it looks like we all came out of a retirement (nursing?) home. Just an observation. I hear a lot of people are into recycling. That's nice as far as it goes, but it's probably better to buy/create things that don't need to be recycled so often, things that last longer before that recycling process has to start, or can be repaired. Recycling takes time and energy. Like some electronic devices that get shipped half-way around the world to a facility that handles them (and often in a not very environmentally friendly fashion). Do you really need that latest (fill in this part with the name of your latest gadget/item), or do you just want it? If you don't buy it, it doesn't need to be recycled. Take a moment to think about what you want and what you really need. That might protect the environment as much as anything, and it will certainly protect your wallet. There are a lot of little things you can do if you want to make a difference. Right now I'm wearing pants (or trousers, if you're in the United Kingdom) that are made (partly) from recycled polyester. I know that sounds a little disgusting and perhaps a bit weird, but if they can stand up to the abuse my fat backside inflicts, they can't be all bad. And it might save a little bit of oil. Okay, with the size of my backside, a lot of oil. I also like to garden, grow some of my own food, and I've done my share of composting when in a situation to do so. I'm not sure how much it helps the Earth, but it helps my mental state. Just one more item - I really don't like the new plastic egg cartons. While they are easily recycled, they don't protect the eggs as well as the old paper ones. It doesn't help anyone if the product isn't as good. The paper ones could be recycled just as easily. They could even be composted. I want my paper egg cartons back. Or else. Anyway, enough of the soap box, here's today's poem*. Then I'll go back and republish yesterday's poem when I get a chance. Had to edit it. That's what I get for trying to do all these poems in between working overtime, or on the train commuting. This has been a busy month (or three). Their blues and their greens. So, what I said was... I love the new header! Such a retro feel. The header is an image from Tweets for a new post-apocalyptic anthology by some of the writers and supporters - and I just happen to have a story in it. At least that's what I've been told! 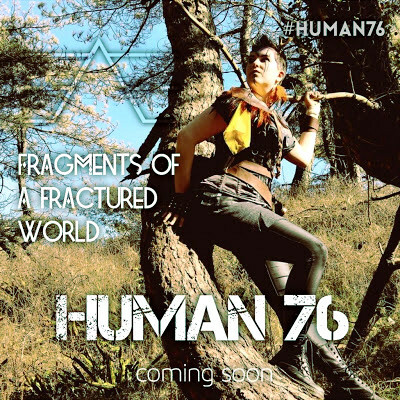 I'm not even sure the title is Human 76, but that's what it appears to be! Nice - both the preamble and the poem. One of my more frequent rants is about the insane amount of packaging. Drives me batty. I really like the first stanza... I can picture it clearly.